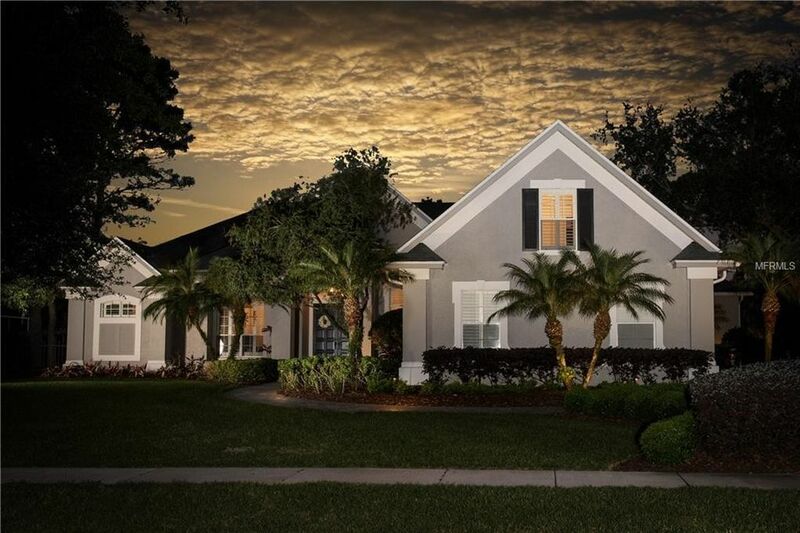 6 BEDROOM/5 BATH SHOWCASE HOME REMODELED IN 2014 WITH EXCELLENT CURB APPEAL & MOTHER IN-LAW SUITE! CONCRETE BLOCK/STUCCO BUILT CONSTRUCTION WITH OVERSIZED PARKING PAD & (SIDE ENTRY) 3-CAR GARAGE ALL UPON A HALF ACRE OF LUSH GREEN PROFESSIONALLY LANDSCAPED LAWN.THE OWNER PRIDE SHOWS IN THIS EXQUISITE CUSTOM BUILT HOME AND WITH FEATURES SUCH AS HARDWOOD FLOORS, VOLUME CEILINGS WITH CROWN MOULDING, & 3RD STORY BONUS LOFT FLEX-ROOM, YOU WILL EASILY SEE THAT THIS IS NO ORDINARY HOME!!! Excellent floor plan and traffic flow for entertaining with POOL ACCESS direct to the patio from the MASTER BEDROOM, the FORMAL LIVING AND DINING ROOM and the KITCHEN/DINETTE spaces. The heartbeat of the home kitchen is directly accessed in the middle and reached from all corners of this custom built prize. Granite, NEW REFRIGERATOR, and Stainless appliances, of course, & so central to the PRIVATE & COZY rear FAMILY ROOM with electric ignition gas fireplace & volume ceilings trimmed with crown moulding. The staircase up from the kitchen, and the gallery hall to the laundry and garage is steps away. Even Fido has his/her own climate controlled niche! (IN-LAW ENSUITE/DOUBLE MASTER SUITE) WITH PRIVATE DOORED ENTRY FROM DRIVE WAY prefect for grad students & IN-LAWS VISITING!!! UPGRADES INCLUDE: PAVED DRIVE WAY, PLANTATION SHUTTER, SS KITCHEN APPLIANCES, GUT RENOVATED BATHROOMS, BUILT-IN CLOSET ORGANIZERS IN MASTER, NEW LANDSCAPE LIGHTING, AND NEW CAMERA SECURITY SYSTEM. WARRANTY INCLUDED!!!! Directions: CONROY WINDERMERE ROAD/AT APOPKA VINELAND TRAVEL SOUTH TO TOREY PINES ENTRANCE (LEFT) DOWN IN VALLEY PAST THE CHURCH--GO LEFT ON TOREY PINES TERRACE, LEFT AT STOP SIGN AT TOP OF HILL, RIGHT AT SUMMERVILLE-HOME DOWN ON RIGHT.